Our annual Christmas puzzle is available now. 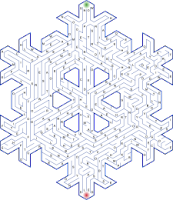 It's a fun maze in the shape of a snowflake. As in prior years, the reward for solving is a video Christmas card, but you'll need to figure out the password by solving the puzzle. Oops. Can't seem to get to the puzzle. It should link to a PDF version of the puzzle... but I'm noticing Blogger is being slow to draw the pages today. Trying going here first if you still can't get the image link to work. I can't get to the puzzle using Google Chrome, which usually handles PDFs just fine. It works fine with Internet Explorer, Safari, or Mozilla Firefox. Nice slide show, Blaine. Always liked "Lieutenant Kije". Have a merry. Thanks for the puzzles. Have a wonderful Christmas and a beautiful new year. I'm tied to a cellular device, so I couldn't open the card. As the children in Dr. Zhivago gleefully screamed, "Ho, ho, ho, I love the snow!" Fun, and it requires remembering one of those rhyming grammar rules! No, Uncle John, my Grammar rules! You should just taste her cookin'. Haha! But you get all grossed out when she gets snugly with your Gramper! It jus' don't happen. Gramper, he sleep in da camper. Grammar, she don' pamper Gramper. Didn't know Kelsey could get around in the kitchen. Oh yeah. Kelsey always gets Cheers in that cute little, flowery apron. Now that I think about it his Wings are the rave. And don't forget those delicious Tossed Salads and Scrambled Eggs. Yum yum! I'm getting all psyched for the Christmas party spreads. Nothing's going to shrink this year. Have a wonderful season, gang.